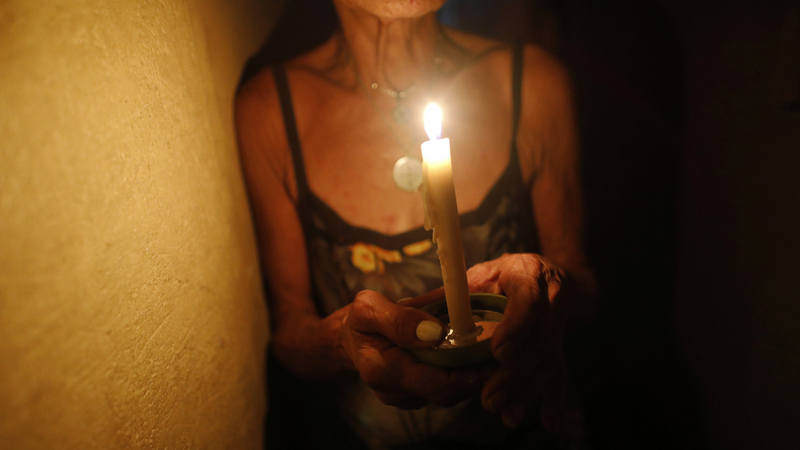 New York Times Journalist Describes An 'Almost Unimaginable' Crisis In Venezuela New York Times reporter Nicholas Casey was in Maracaibo, Venezuela, in March 2019 during a six-day power outage. "By the fourth day," he says, "you started to hear shots getting fired in the street." Venezuela's power grid crashed on March 7, 2019, throwing almost all of the oil-rich nation's 30 million residents into chaos for nearly a week. Venezuelans have been suffering one calamity after the next, but in recent weeks, much of Venezuela has had to go long stretches without electricity. New York Times journalist Nicholas Casey was in Maracaibo, Venezuela, in March when the country was hit by a six-day blackout, considered at the time the worst in Venezuela's history. He says people initially assumed that the outage had been planned and that power would be restored after a few hours. But as hours stretched into days, the country fell into chaos. "By the fourth day of the power outage, that was when you started to hear shots getting fired in the street," Casey says. "People were beginning to loot, and the store owners were coming out to defend their stores." As Andes bureau chief for the Times, Casey has been covering the deepening economic and political chaos in Venezuela. He says the current crisis in the country is "almost unimaginable." "This is an oil-producing country. This was one of the most wealthy countries in Latin America," he says. "And now this is a place where there are shortages of food, shortages of medicine. People's daily lives are spent trying to figure out how they're going to get basic things like eggs or coffee." Casey notes that Venezuelan President Nicolás Maduro, who took over after the 2013 death of Hugo Chávez, has become increasingly authoritarian, imprisoning political rivals and cracking down on protesters. Maduro has also cut off access for journalists, including Casey. "The government doesn't allow me to live in Venezuela anymore. I lived there in 2016, and by the end of the year, my visa was revoked," Casey says. "Their reaction to the stories that I've had — it's been terrible sometimes. Anything that they see that doesn't line up with their view of what's happening in the country they consider to be a lie." The U.N. estimates that it's upwards of 3 million people who have left. Now remember, this is a country of 30 million people. So we're talking about 10 percent of the population that has gone. And you see this when you walk around the streets of Caracas, which I have, or Maracaibo, which I did just a few weeks ago. There are areas which are completely empty. You walk down streets and you see that there's two or three people in one house, and then another house is gone, or another house has got a family of what looked like squatters, because they've just moved into the place. And at that point you have to figure out how you're going to get somewhere. And that usually means you're going to walk, and often Venezuelans will spend a few days on the border, but then they keep moving, because there are so many Venezuelans in these border towns. There's no jobs for them there, so people set off on foot. They have usually a suitcase, backpacks, but they're trying to travel very light, because they know that they're going to have to carry everything on their backs that they're bringing, and hitching rides occasionally. Sometimes they can save a little bit of money to take a bus ride a short distance, but basically they are trying to put as many footsteps between them and Venezuela as they can. And it can be an extremely long process to try to travel these countries; these are very mountainous countries on foot. On one end, these countries are trying to pressure [President] Maduro now to step down, because they know that this migrant crisis is going to get even worse the more politically unstable the country gets. Countries like Colombia understand that Venezuela used to be a country that took their immigrants, especially during the darkest days of the paramilitaries and the guerrilla fighting, but at the same time, they understand they can't take every Venezuelan that comes. And not only that, because of this crisis that's getting worse and worse, because of lack of medicine mainly, people are coming into these countries with diseases that should be controlled in Venezuela — diseases like diphtheria, malaria, tuberculosis have made a huge comeback in Venezuela. So if you're a neighboring country like Brazil or Colombia or a country like Ecuador or Peru, who are farther away but are also taking immigrants, this is a very scary situation that's right on your doorstep. The further along that you got, the less popular that Maduro was becoming, the more that you began to see that he was leaning on this medical system to try to drive votes. The further along that you got, the less popular that Maduro was becoming, the more that you began to see that he was leaning on this medical system to try to drive votes. In one election in 2015, there was a doctor who said that when it appeared that the opposition was ahead in a legislative vote, that they actually not only saw the doctors out that afternoon to try to get people to go vote, [but] they also dressed other people up, who were not doctors, as doctors and gave them medicine to go get people to vote, to try to get them to trust these doctors to go and vote. In the last elections that were taking place in 2017 and 2018, there was a doctor who was explaining to me about how he was in a small town and wasn't able to give medication to certain patients that were from the opposition and also was told to withhold things like oxygen tanks and not put them out early in the year because they wanted to bring out all the medicine and the oxygen tanks, which were largely in shortage, just before the election, just before people were going to vote, essentially to give the impression that Maduro had solved this medical crisis before people had to go vote for him again. I think there's a way out, and Venezuela, we have to remember, has lots of oil. So no matter how bad the economic crisis is, if there is a way out of the political crisis, there is a way for the country to be able to produce the money that it needs to be able to get back on its feet again. Unlike many other countries in the world, it's extremely blessed to have this natural resource there. But the way out is to have an election. People need to be able to choose who their leader is, because until that can happen, whoever is in charge — whether it's Juan Guaidó saying that he is the president or Nicolás Maduro saying that he is the president — isn't going to have the legitimacy to do anything about it. Venezuelans ultimately need to be able to choose who's going to be their leader, and they might choose someone again from the left. After all these years, I'm not sure that that's what they're going to do, but they need to be able to have a choice between a number of parties from the opposition and whoever Maduro would put as his candidate, and whoever wins can then take the next steps. Now, it's not going to be a fast process. This is something that's going to take years, to rebuild this country. But it's not necessarily the level I think always of devastation that makes people feel the worst. It's the fact that things are getting worse every day. Even if things were at a low point in Venezuela, if people could see that there was a reason for hope that things were starting to get better, I think you would start to see people coming back to Venezuela. Amy Salit and Mooj Zadie produced and edited the audio of this interview. Bridget Bentz, Molly Seavy-Nesper and Alex Leff adapted it for the Web.